I arrived to Orlando on Sunday night for the PADI Tec 40 CCR Instructor x-over Course. The program was held in the YMCA Aquatic Center in International Drive. I was very happy to find some people I knew in the course; it made it most welcoming to see those friendly faces there. The x-over course was spread over 3 days on site but I might say the process of crossing over to the PADI system for rebreather education started weeks earlier. 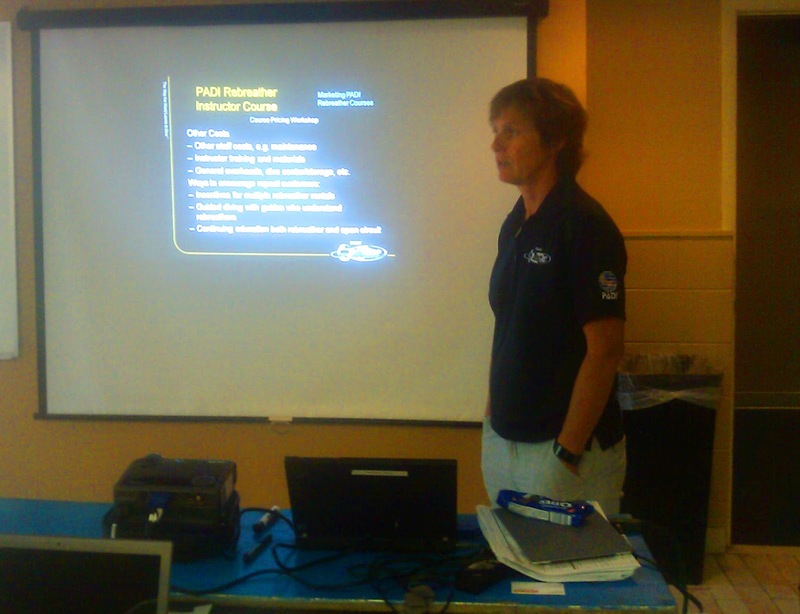 Prior to the course we had to make time and study in depth the PADI Rebreather and Advanced Rebreather manual. This material is a very complete and thorough guide written and revised by some of the most renowned rebreather instructors, manufacturers and explorers in the industry. It’s very nice to find that so much of the knowledge spread over forums, magazines and blogs has been finally gathered in one, very well designed educational material that will serve as a guide and reference for both new and experienced rebreather divers. In addition, the PADI Tec 40 CCR student manual is another great tool that includes the general rebreather theory, the mindset of a technical diver (which is something applicable either for an open or closed circuit diver) and general information regarding equipment and manufacturer differences. The Tec 40 CCR manual is a great source of information for the novice rebreather technical diver and a great reminder for the open circuit technical diver. I guess this is not a surprise for all the people teaching and working with the PADI system in technical, recreational and now rebreather diving. On Monday, Georgia Hausserman took us through the theory of the instructor manual of the PADI Rebreather and Advanced Rebreather Diver Courses and the Tec 40 CCR course. 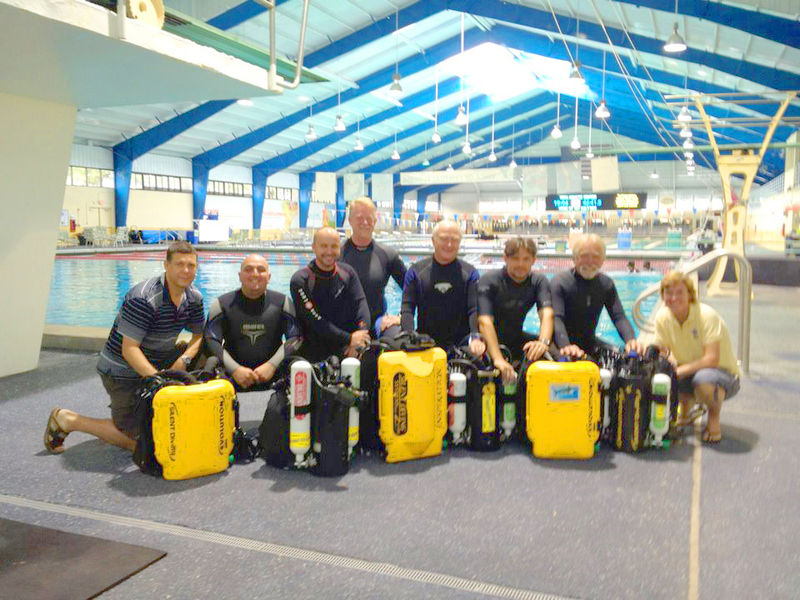 A great thing of this course was to have Mike Fowler and Peter Den Hann from Silent Diving Systems. The insight and guide on the Ambient Pressure Diving Rebreathers and their own teaching experience came in as a great resource and made a big difference for us. Tuesday started with a setup practical application as outlined in the courses and continued with a skill circuit in the pool. After this we did teaching presentations using the PADI system and kept learning new things from the people who make the APD rebreathers. Wednesday started with another CCR setup and we performed the Tec 40 CCR diver course skills in the pool. After this another practical application was performed, this time to clean and disassemble the units. Right after this we had time to talk on the classroom, do the Rebreather and Advanced Rebreather Instructor exams and have some more manufacturer insight. This was a great experience for me. I’m happy to have participated and very excited about the soon to come recreational version of the APD rebreathers. Version 5 looks very promising and will allow student divers to go through all the range of PADI’s rebreather education, from basic recreational diving to Tec 100 CCR with one, proven, modular and adaptable unit. The new APD rebreather should be out before DEMA and a very exciting and promising future of rebreather diving seems to be ahead of us all. I will be in Orlando for Rebreather Forum from Friday to Sunday and will be back in the Galapagos on Tuesday. Needless to say, the Tec 40 CCR course and Rebreather & Advanced Rebreather will be available from Galapagos Rebreathers and the Galapagos Tip Top Dive & Training Facility. I will write a report on rebreather forum upon my return.